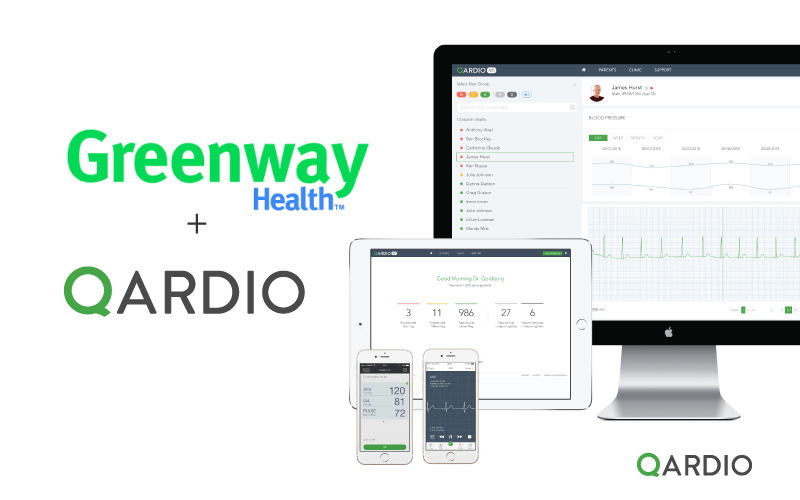 SAN FRANCISCO – June 19, 2018 – Qardio, the leading digital health company, today announced its remote monitoring platform, QardioMD is integrated with Greenway Health’s electronic health record (EHR) and practice management solutions. QardioMD platform offers Qardio’s medical grade products and remote monitoring solutions to doctors, to help manage their patients’ health more efficiently while making billing for such care easier. Addressing the growing market needs, Greenway Health doctors can now utilize the QardioMD platform in conjunction with their EHR system, and have their patient data and files seamlessly synced between both platforms. As a part of the solution, doctors can provide their patients with Qardio’s medical-grade products such as wireless blood pressure monitors and smart scales and body analyzers, so patients can easily be monitored outside the doctor’s office. This new integration gives Greenway doctors an opportunity to grow their practices and revenues, and offer better care. “We’re pleased to partner with Qardio through the Marketplace to enable our customers to easily evaluate and select solutions such as Qardio’s that support their success in care delivery,” said Greg Shilling, Greenway VP of Corporate Development. QardioMD platform increases practice efficiency by reducing routine visits, adding contextual patient health data to drive better health outcomes, and supporting preventative and chronic care management reimbursable under new CPT codes. The QardioMD remote monitoring solution is available to Greenway Health doctors via Greenway Marketplace at www.greenwayhealth.com/marketplace/qardiomd. Doctors using other EHR systems can learn more at www.QardioMD.com.